There can be no further doubts about their doubles pedigree. The youthful Indian pairing of Satwiksairaj Rankireddy and Chirag Shetty gave the top-seeded Indonesian combination of Marcus Fernaldi Gideon and Kevin Sanjaya Sukamuljo a truly harrowing time before succumbing at 12-21, 24-26 in an exciting semi-final of the French Open World Tour Super 750 badminton championship in Paris on Saturday. Just how much the Indians have come on in the course of the past year could be gauged from the manner in which they recovered from the comprehensive thrashing they received in the opening stanza, changed tactics and traded punch for punch with the redoubtable World No 1 pair in the second. In the process, they were able to not only match the blinding speed of the Indonesians but also hassle them with the powerful, well-directed smashes of Rankireddy. As is their wont, Gideon and Sukamuljo came out smoking, simply not allowing the Indians to settle into any kind of rhythm, and making repeated opportunistic forays to the net to kill even the marginally high shuttle. Opening with a 6-0 lead before the Indians had even taken a breath, the Indonesians powered to 11-4 at the mid-game interval. The Indians did manage to reduce the margin to 9-12 when the Indonesians relaxed just a little after the lemon break but were then left gasping as Sukamuljo and Gideon stitched together a seven-point reel to 19-9, before making sure of the opening game without much further ado. A 5-1 lead at the start of the second game with some astute serving and follow-up gave the Indians the confidence that they could last the course with their opponents. Although Gideon and Sukamuljo neutralised the advantage at 9-all, it was a see-saw battle from that point onwards, all the way to the finish line. Shetty's clever manoeuvring gave Rankireddy the opportunity of unfurling his power-packed smashes and the Indians kept their net game tight to prevent their rivals from finishing the rally by the short route. Saving a match-point at 19-20, the Indians actually held game-points of their own at 21-20 and 22-21, before the world's top combination just about managed to prevent the tie from going to a decider. The result ended the Indian challenge at the French Open and sent the Indonesians into Sunday's title reckoning with another young, unseeded pair – Han Chengkai and Zhou Haodong of China. The Chinese edged past the South Korean duo of Lee Jhe-Huei and Lee Yang by a 13-21, 21-18, 21-17 scoreline, in the only event at the $775,000 prize money tournament where most fancied contenders were left by the wayside and three unranked combinations made the semi-final grade. There was yet another shock result in the men's singles. Two-time former world champion and Olympic gold medallist, Chen Long of China, sent current world champion Kento Momota packing with a 21-18, 21-8 verdict. The 52-minute encounter saw the resurgence of the Chinese great after a year of poor results and burst the bubble of the Japanese left-hander's invulnerability. In Momota's defence, it must be said that he appeared to be dragging his leg all through the second game and appeared to have hurt his knee when he landed awkwardly after executing a jump smash. Otherwise, the two appeared fairly evenly matched, with Momota making up a 10-16 deficit in the first game to close to 15-16, before dropping the game. He appeared all set to drag the contest over the full distance and let his own stamina weigh in the balance, but the injury prevented him from moving on the court with his normal languid grace. 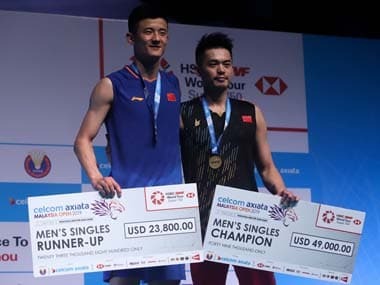 The sixth-seeded Chen had made the semi-finals with victories over Frenchman Brice Leverdez, Jan O Jorgensen of Denmark, and Asian Games gold medallist Jonatan Christie of Indonesia. 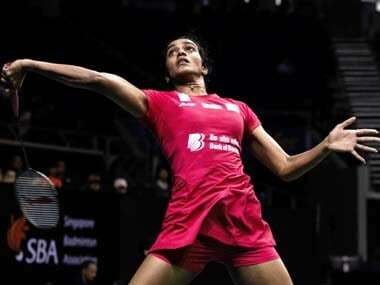 However, he had come into the penultimate round with the knowledge that he was the underdog in the clash with Momota. The reigning world champion had beaten Chen twice earlier this year, with comfortable straight-games victories in the Badminton Asia Championships in April and the Thomas Cup in May. But the rigours of the cramped, crowded circuit appeared to have finally caught up with the Japanese southpaw and caused the injury that could keep him out of rest of the Far Eastern tour, and possibly the year-ending World Tour grand finals in Guangzhou in December. Chen, whose over-all record with Momota reads 5-2 in his favour, will take on compatriot Shi Yuqi in Sunday's final at the Stade Pierre de Coubertin. The latter made the grade with a facile 21-11, 21-16 win over Denmark's Rasmus Gemke, who had upset Taiwan's No 4 seed, Chou Tien Chen, in the opening round itself. Shi trails his fellow-countryman 2-4 in career head-to-heads but has the satisfaction of knowing that he beat Chen in their most recent two meetings – at the All-England Championships in March and the World Championships in Nanjing in August. The chances are high that, on Sunday, he will complete a hat-trick of victories in 2018 over the 2014 and 2015 world champ. As for the women's singles final, it will be contested between the top two seeds in the competition – reigning World No 1 and top seed, Tai Tzu Ying of Chinese Taipei, and Japan's Akane Yamaguchi. Tai was fit and deceptive enough to come through a tough semi-final against China's Chen Yufei at 18-21, 21-12, 21-14, while Yamaguchi edged China's He Bingjiao run with a 20-22, 21-19, 21-19 scoreline in a tight, bruising 71-minute semi-final. It will take something really special from Yamaguchi to narrow the 5-7 career head-to-head deficit against the Taiwanese ace, knowing that she has lost to Tai on the most recent three occasions, including in straight games at the All-England Championships and the Uber Cup earlier this year.